Today’s hearing, which was attended by diplomats from eight different countries, saw the main witness in the case, 15 year old Islam Dar Ayyoub, put on the stand. The trial will resume tomorrow, 10 AM at the Ofer Military Court. The hearing in the case of Nabi Saleh protest organizer, Basem Tamimi, which took place today at the Ofer Military Court, saw the main witness put on the stand and interrogated by the prosecution for nearly five hours. Islam Dar Ayuoub, who was 14 at the time of his arrest confessed to having given false testimony at the police due to the immense pressure he was placed under before and during his interrogation. The courtroom was packed by over a dozen diplomats led by the Consul Generals of Spain, England, Malta, France and the EU who came to monitor the proceedings in Tamimi’s case, who was recently declared a human rights defender by the European Union. In his examination Dar Ayyoub was asked about his arrest which took place last January in a pre-dawn military raid on his house. During his arrest he was beaten up and kept in blindfold and handcuffs for several hours until the interrogatory. Dar Ayyoub said to the court that he has been advised by one of his interrogators before the official questioning began to point out Basem and Naji Tamimi as main organizers, and made to believe by another that he would be released if he does. A video of the examination shows a very tired Islam, completely dominated by three officers who at times make violent, threatening gestures, shout and ridicule him. The boy is seen constantly yawning and asking when he will be released. At some point he breaks down in tears for several minutes. The boy was not read his rights, nor offered the opportunity to have his father present or speak to his lawyer, who was present at the police station during the interrogation, all of which in violation of his legal rights. Later in the day, in clear violation of due process, the Military Prosecutor chose to confront Islam with the protocol from his own trial, despite having neglected to present the Defense with the material beforehand. The judge allowed the line of questioning to continue despite objections from Basem’s lawyer. The outraged Defense Attorney asked that judge, Major Eti Adar, disqualify herself on the grounds that “the Defense’s rights have been forfeited”, the judge however claimed to be impartial and refused to comply. The trial is scheduled to resume tomorrow, with the testimonies of six witnesses, including another main witness, 15 year old Mo’atasem tamimi. The audio-visual recording of 15 year-old Mo’atasem Tamimi’s interrogation proves he was questioned in an unlawful manner, which amounts to systematic violation of minors’ rights in order to coerce them into incriminating themselves and others. During his interrogation, the boy was led to believe that if he will implicate others, he may receive a more lenient treatment. Updated report on night raids on Nabi Saleh by the Israeli Occupation Forces – 3 arrested including 1 child. The Israeli soldiers arrested three young men as they carried out a search (terrorizing) operation last night in the village of Nabi Saleh. Intruding into more than 25 houses the soldiers took pictures of the rooms, searched through private proprieties and assaulted a number of women and elders. 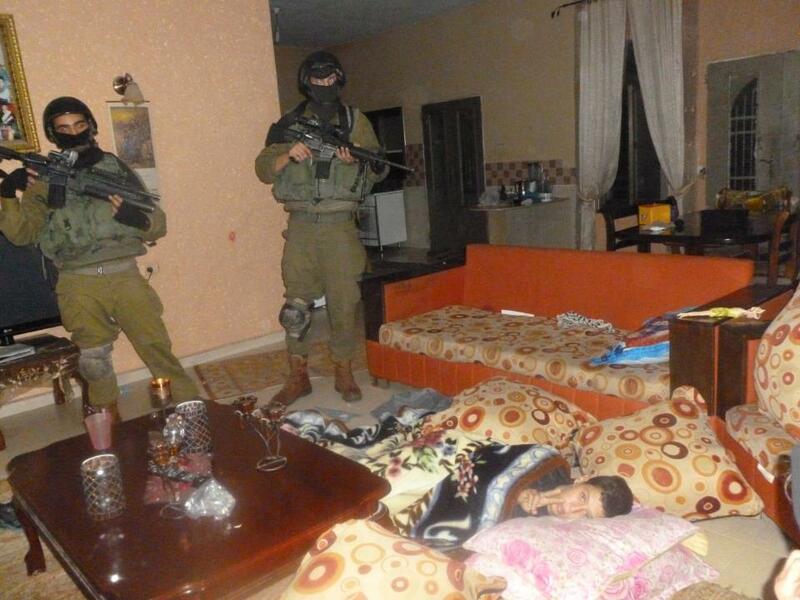 Photo: Israeli Occupation Forces in the home of Nariman and Bassem Tamimi. Tamimi Press | – A big number of Israeli occupation forces storme…d the village of Nabi Saleh situated Northwest of Ramallah at midnight. The IOF raided a big number of houses in the village scattering private propriety and filming the interior of th houses. After which the soldiers arrested three young men: Rami Hussein al-Tamimi, 33, Uday Abdel-Hafiz al-Tamimi 20 years and Mutasim Khalil Al Tamimi, 16 years old. The detainees were taken to an unknown destination. The operation did not just resume to that, the soldier went on and assaulted elders, women and children filling the village with a state of fear and horror. Witnesses said that more than 100 soldiers and dozens of Israel vehicles participated in this vast operation which started at midnight and ended at three o’clock in the morning. It is important mentioning that the occupation forces had sealed off, putting pressure on the village of Nabi Saleh for the last two days during which the main gates were closed off, obstructing peoples daily activities and interfering in the conference organized for the victims of torture. 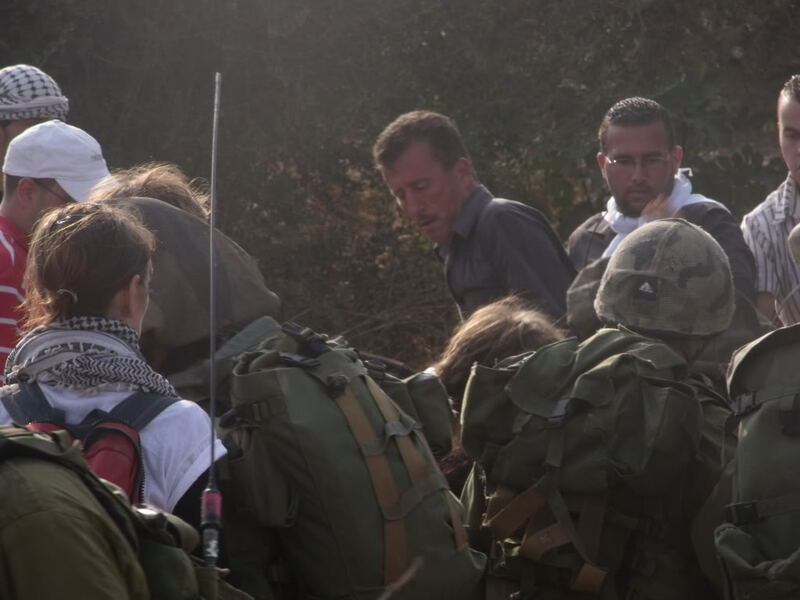 In response to the assault, the Palestinian Popular (uprising) in the village of Nabi Saleh, said that this barbaric and cowardly act carried out by the occupation forces is an indication of confusion and anxiety experienced by the leadership of the Israeli army as a result of continuous popular activities in the village. Despite the increase of violence by the Israeli occupation and their endless attempts to use all means to suppress the village and stop the weekly marches against the settlement, these acts of terror will not deter the people of the village, nor shake the local and international solidarity but on the contrary, it will push them to survive and continue their struggle against the occupation, aiming towards freedom and independence. Occupation arrested 3 youths and running more than 25 houses and depicts its Chambers and tampering with the contents and the number of women and the elderly in the village of Nabi Saleh tonight report: Mohammed Attallah Al-Tamimi Tamimi: |-moved large numbers of Israeli occupying forces midnight Nabi Saleh village northwest of Ramallah and raided several village houses and tampered with its contents and filmed what was inside before arrested three youths were Rami Hussein Al-Tamimi, a 33-year-old Uday Abdul Hafeez Al-Tamimi, 20-year-old mutasem Khalil al-Tamimi 16 Years and took them to an unknown destination and beat a number of old people, women and children in the village waaatht havoc reducing it to the horror arena. Witnesses said more than 100 soldiers and dozens of Israeli tanks participated in the operation which began at midnight and ended at 3 a.m., and it is worth noting that IOF had sealed stressing Nabi Saleh village in the past two days and closed the gate crashing a Conference for victims of torture held in the village yesterday. In response, the Palestinian popular resistance movement said (uprising) in Nabi Saleh village that this barbarous and barbaric and cowardly act carried out by occupation forces is a new directory on the flop and anxiety experienced by the Israeli army command as a result of continuing popular actors in the village and marches against settlement despite continuing weekly Israeli escalation and the occupation using every means to suppress the village without his ability to do so, adding that all of these barbaric acts will not deter the villagers and with solidarity and freedom fighters but also prompt them to continue to And continue their struggle against Israeli occupation to freedom and independence. Today the Israeli occupation forces continued the closer of the main entrance to the village of Nabi Saleh in the face of the villagers and citizens willing to pass to and out of the villege. The IOF continued to impose a tight siege and a security cordon on the village for the second day in a row. The reasons for such arbitrary and brutal attitude are unknown. The closure prevented citizens from the village and other areas from the right of mobility. Citizen were forced to bypass untrodden roads and undertake exhausting walks on foot to reach the village or move out of it. Further the occupation forces prevented dozens of trucks and cars to travel between the Northern to Central West Bank as the village of Nabi Saleh is situated at an important crossroad between the Northern areas and the city of Ramallah. Witnesses said that the occupation also prevented a car belonging to the Red Cross from crosing the barrier and sent it back from where it came from after being held for more than a quarter of an hour at the entrance of the village. The Palestinian movement of Popular Resistance (uprising) in the village of Nabi Saleh, said that these arbitrary measures demonstrate the failure of the occupation and put emphathis on the effectiveness of the battle being fought by more than a year and a half by the people of the village of Nabi Saleh. The villages who continue to struggle peacefully and organize events despite the repression and terror, arrests and threats. The movement stressed that this collective punishment carried out by the occupation forces against the village will not discourage our children from continuing their struggle but on the contrary, it determines them to continue the path of resistance until victory. Nabi Saleh residents, Palestinian activists, and international and Israeli supporters marched peacefully from the center of the village shortly after the Friday prayer. Following the reports of a coming agreement between Fatah and Hamas, demonstrators called for Palestinian reconciliation and unification, in order to boost Palestinian struggle against the occupation. As always, the peaceful demonstration was met by an attack of the Israeli army. Volleys of tear gas canisters were shot on the entire demonstration, from a cannon installed on military jeeps. Single canisters were also shot by Israeli soldiers directly at unarmed protesters, in violation of their army’s own regulations. Israeli forces also used the “skunk”, a truck carrying foul-smelling water cannon. However, the “skunk” couldn’t reach but few protesters due to a barricade built out of rocks that protesters installed at the entrance to the village to prevent army incursions. Few people also threw stones at the army’s position and managed to ward off some soldiers advancing on foot from a different direction. At least 3 people suffered from minor injuries from the Israeli attack. One protester who suffered from gas inhalation was carried by others a few dozen meters until they reached a road, where an ambulance waited to rush him out for medical treatment. Despite the cold and rainy weather, the demonstration persisted for about 3 hours, after which the army retreated to its post at the main entry to the village. Dozens participated in this week’s demonstration in Nabi Saleh against the theft of its lands and spring by the Halamish Israeli settlement and the Israeli occupation that sustains it. Nabi Saleh residents, other Palestinians, and international and Israeli supporters marched peacefully from the center of the village. Referring to recent news, demonstrators called for Hamas and Fatah reconciliation in order to boost Palestinian struggle against the settlements, annexation wall and occupation. As always, a peaceful demonstration met with Israeli army attack. Volleys of tear gas canisters were shot on the entire demonstration from a cannon installed on Israeli military jeeps. Sole canisters were also shoot by Israeli soldiers directly at people, in violation of their army’s own regulations. Israeli forces used their “skunk” track, carrying a foul-smelling water cannon, which said to be of different “flavor” this time, according to protesters. However, the “skunk” couldn’t reach but few people due to a rocks-made protesters road block that prevented it and all other military jeeps from deepening their incursion into the village. Few people also threw stones at the army’s position and managed to ward off some soldiers advancing on foot from a different direction. The demo, which was accompanied by a rainy cold day, lasted about 3 hours, after which the army retreated to its post at the main entry to the village.